On May 4th at a demonstration in Haymarket Square to protest the police brutality a bomb exploded in the middle of a crowd of police killing eight of them. The police arrested eight anarchist trade unionists claiming they threw the bombs. To this day the subject is still one of controversy. The question remains whether the bomb was thrown by the workers at the police or whether one of the police’s own agent provocateurs dropped it in their haste to retreat from charging workers. 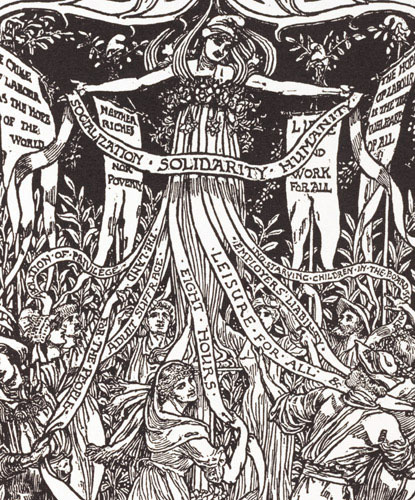 In Paris in 1889 the International Working Men’s Association (the First International) declared May 1st an international working class holiday in commemoration of the Haymarket Martyrs. The red flag became the symbol of the blood of working class martyrs in their battle for workers rights.